He was fortunate enough to walk in the British and Alpine mountains from a young age due to a passion encouraged by his parents. Holidays were in the Lake District, Scotland, North Wales and then the Alps. He seeks out adventure and adventurous routes. 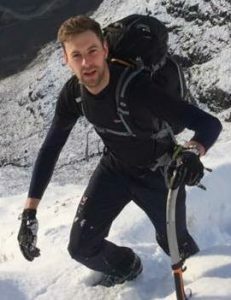 He enjoys big mountain days exploring the British mountains, especially in winter. James is also passionate about helping people develop their skillset and experience. He aims to inspire and educate people and instil a passion so they can experience environments and develop themselves personally and professionally.